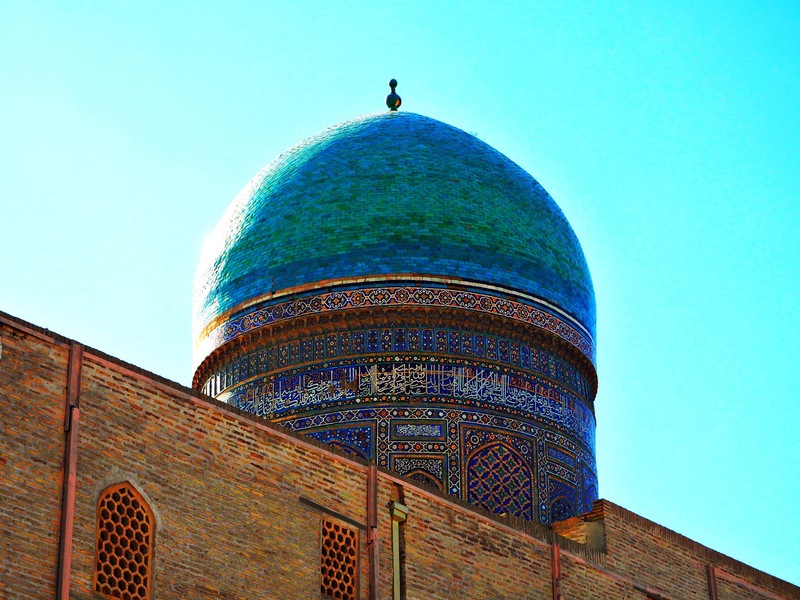 Uzbekistan – Sometimes the wrong train will get you to the right place. The Uzbek border was about 45 minutes of bureaucracy and waiting. Not as bad as other experiences we have heard, but certainly tougher than any other country so far. After staring at our passports for a good five minutes, the first man stamped our passports, unsmilingly, and we proceeded into a room with a dozen other locals where we were to fill out a customs form declaring, among other things, how much money and what currencies we were bringing with us. After a somewhat thorough bag search by a cheery and laughing Russian woman (checking for illegal medication, dissenting books, and contraband photos mostly) we were let through. At this point it’s worth mentioning the money situation in Uzbekistan, as we didn’t fully understand it until our second day in the country. First, the largest bill of the official currency (the Som) is only 5000, which is equivalent to about $0.80. So any time a purchase is made (a meal, for example), a transaction involving huge stacks of cash is undertaken. This is mostly because of the rampant inflation of the Som since Uzbekistan’s independence and the government’s refusal to admit that such inflation has happened, thereby not creating any bigger bills. Another product of this is a thriving black market in money conversion, so the official exchange rate between the Som and the dollar is less than half of what is gettable on the black market (by cash stack wielding money changers on the street corner, for example). All this means that the dollar is king in Uzbekistan, and transactions involving the official exchange rate (at an ATM dispensing Som, or a POS credit card transaction, for example) are to be avoided at all costs. Yet, most transactions are done in the local currency, so it’s best to bring in as much US cash as you need to cover your trip, converting it to Som as needed by unofficial money changers. Needless to say, we lost a fair sum of money by exchanging our Tajik Somoni at the official rate with an unofficial money changer at the border. They prey on the ignorance of incoming tourists in this regard, and they benefit greatly from it. Fortunately our exchange was only $30 or so, so we didn’t lose too much. 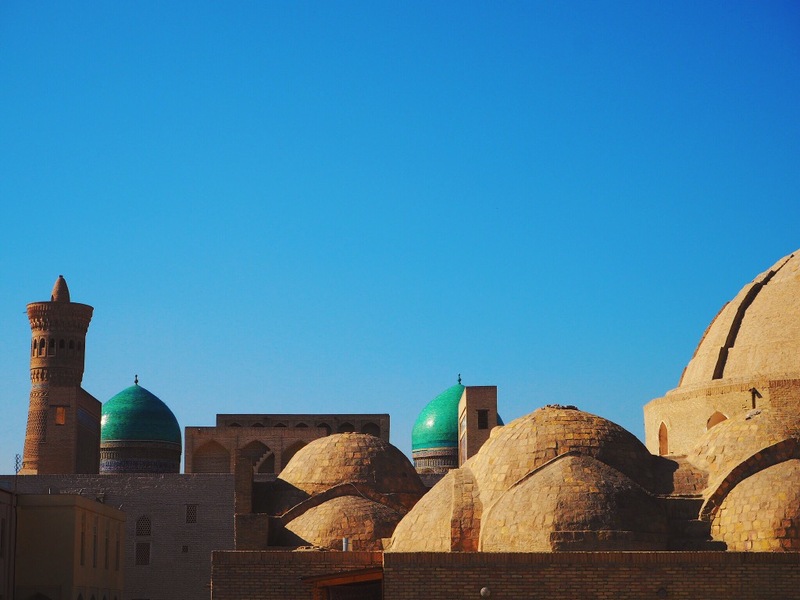 After crossing the border a handful of taxi drivers approached us about a ride to Samarkand or Bukhara. We agreed on a ride to Bukhara, our first destination in Uzbekistan. After we set out, it became apparent that the family sharing the taxi with us and the driver were heading to Samarkand, so the driver tried to convince us to come there instead. We insisted on getting all the way to Bukhara, whether or not we’d need to go via Samarkand (at least a 9 hour drive via Samarkand). It wasn’t clear which path we were taking until later. Fortunately, given our early start, we made it to Qarshi just after sundown. There, our driver arranged another driver for us (at no cost, since we already paid for our whole ride), since our car was heading east to Samarkand. We finally rolled into Bukhara at around 9pm and were ushered into yet another car (again at no cost) to make it all the way to our guest house. Starving, we dropped off our bags and headed to the nearest restaurant. We were a bit surprised by the prices, considering we were working with an exchange rate less than half as favorable as the one we should have been using. It turns out we were a bit short on cash to pay the full bill, but nobody at the restaurant could point us to an ATM, so they graciously accepted what we could give (about $1 short, but we thought we were $3 short) and thanked us for our patronage. The next day we wandered around the beautiful old town of Bukhara, soaking up the Middle Eastern vibe of the place, and concluding that we liked Uzbekistan so far, aside from the prices at least. We finally located an ATM (the only one in town, seemingly) and apparently broke it by some complex string of commands. Fortunately it recovered some hours later by way of a restart and we were able to get US dollars out. At this point we took our newly-minted US dollars to a restaurant and paid for our meal with a $100 bill and asked for our change back in Som. We were expecting a bad exchange rate, but we inadvertently discovered the existence of the double exchange rate instead. They gave us back way more than we were expecting (in the form of several stacks of bills, of course), which we counted back at our hostel. We counted and recounted and counted again and were dumbfounded at how they could have botched the conversion so badly. Being the upstanding and moral travelers we are, we took the remainder back to them and tried to explain how grossly they had miscalculated. After much confusion, they insisted that we keep it, and that they had used the correct rate. It was at this point that we realized that something truly weird was going on, and our hostel proprietor kindly explained the dual exchange rate for us. So as it turns out, the restaurant did give us a bad rate, but our moods were lightened by the realization that the things we had been paying for were in fact less than half the price we had been calculating for them. Rookie mistake. Kalyan minaret overlooking a courtyard. 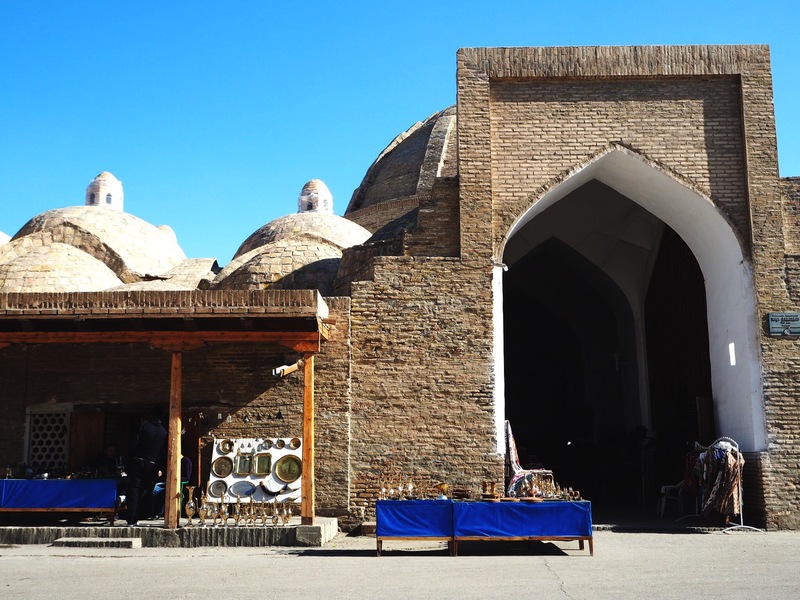 One of the many mosques in central Bukhara. 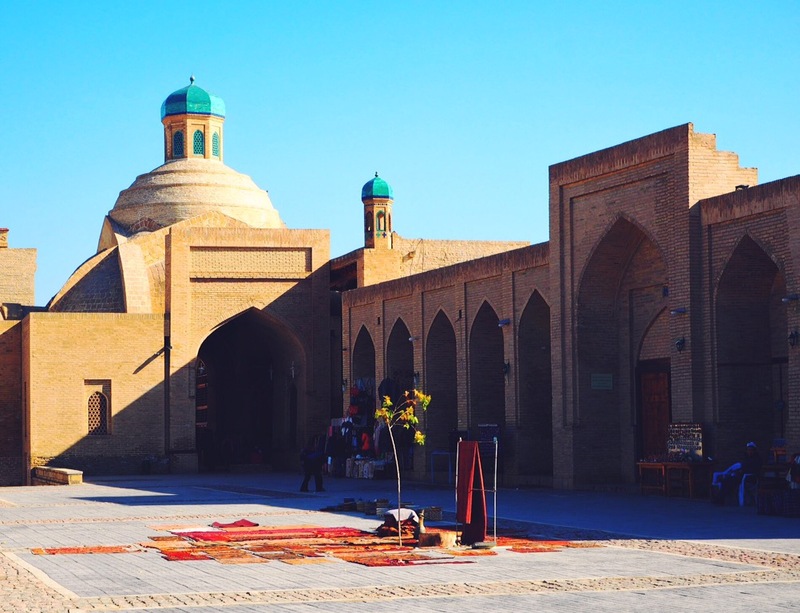 Bukhara is one of the centers of the Central Asian carpet-making industry, so we thought it wise to invest in some carpets to put in our future home while we were there and have them shipped back for safe keeping. As we walked around town we had our eye out for any and every carpet shop to inspect their wares. After looking around at a few we settled on one, crewed by a few students in their 20s (the shop belonged to their uncle). Oona has quite a bit of experience in carpet sales, not to mention a pretty specific taste in the matter, so we scrutinized a great number of carpets, forcing the unflappable salesmen to unroll rug after rug while we suggested different colors or patterns. After settling on our three favorites, we began the bargaining process. 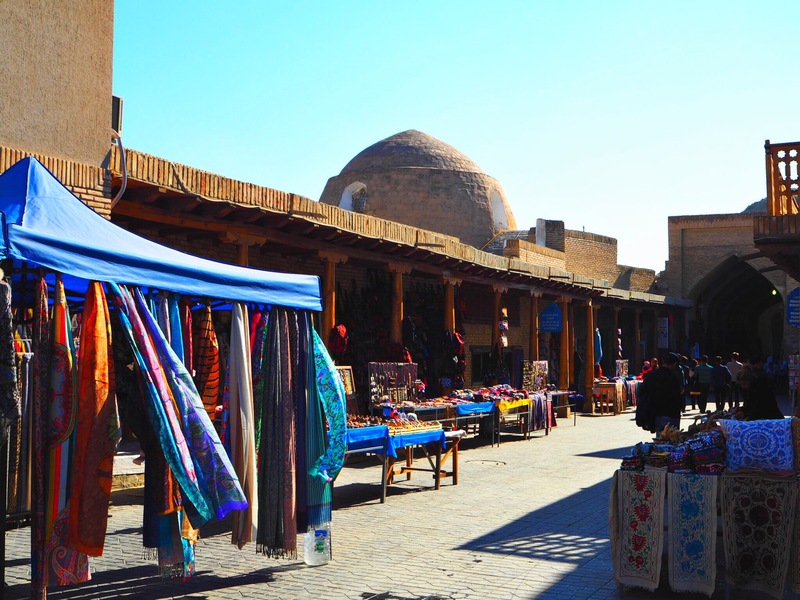 Their initial quote was absurdly expensive, but the fact that we were buying three items and that Bukhara was steadily becoming more and more devoid of tourists for the winter weighed heavily in our favor. We ended up at a price roughly half of their initial offer, including shipping. Once it became clear that we weren’t going anywhere near their initial price, they called their uncle to the store for the final stages of the deal. We were happy to purchase three beautiful rugs for a paltry sum compared to European standards, and it was fun doing business with the shop. The rest of our time was spent wandering around town, enjoying the clear (but cold) weather, and eating lots of plov and lagman. 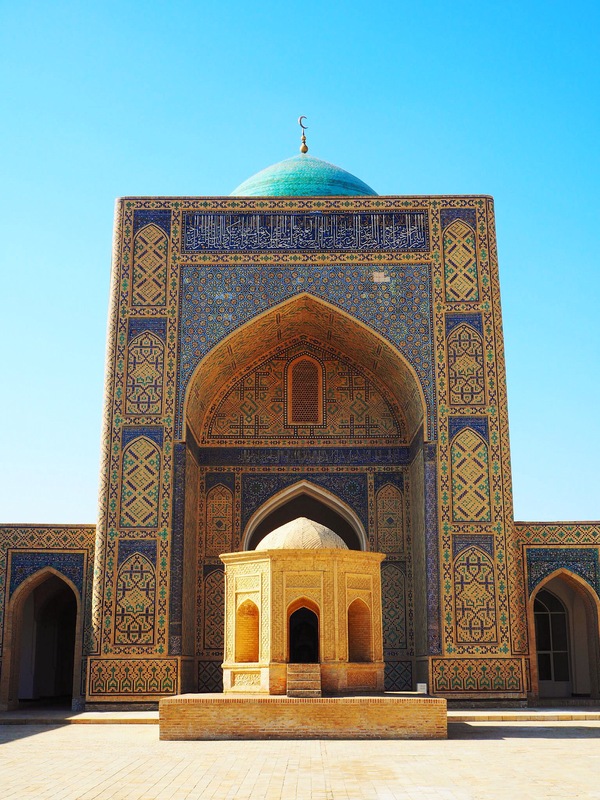 There is a new high-speed train service (unheard of by Central Asian standards, which had us floored) connecting Bukhara to Samarkand (and on to Tashkent), so we booked tickets to our second destination (Samarkand). The train was a breeze, hardly any people on it and it zipped us along to Samarkand in under two hours for a very affordable tag, to boot. 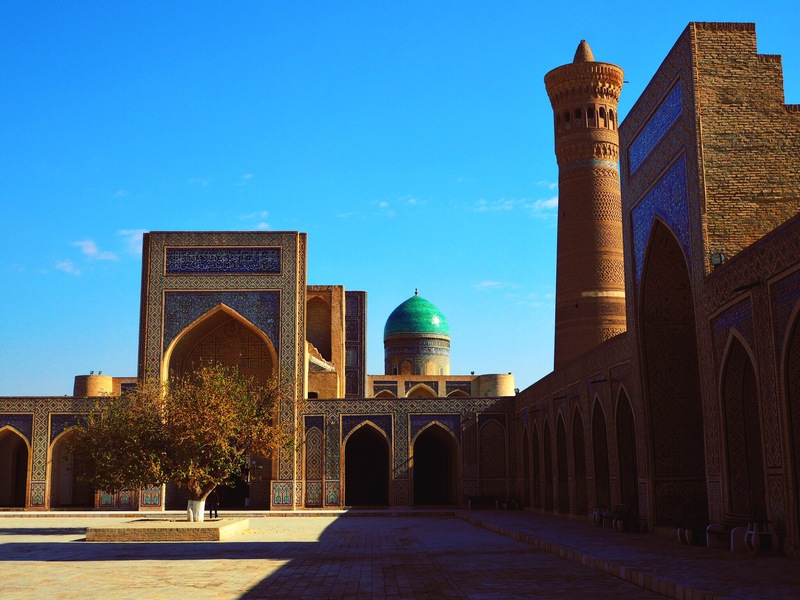 After arriving at Samarkand it became evident that the crowded portion of the trip is from Samarkand to Tashkent, with people pouring in from all sides while we were trying to disembark. We thought it wise to book our outbound tickets for a few days later while we were there only to find it fully booked. We settled for the slow train instead. 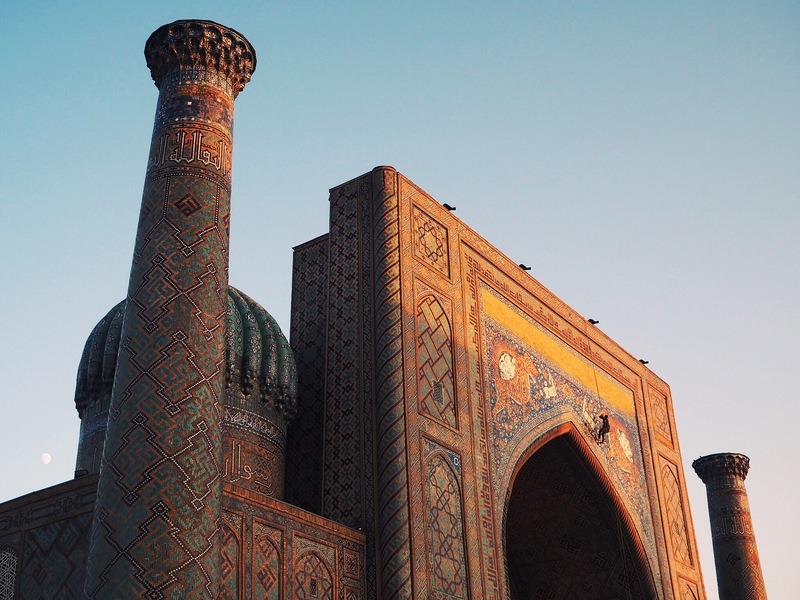 We were expecting great things from Samarkand, but were a bit disappointed. 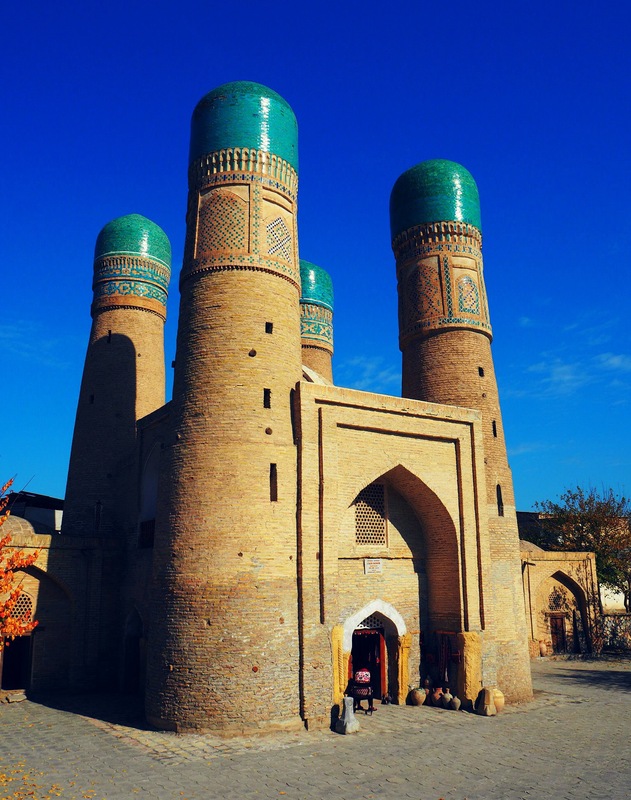 It seemed much like a bigger, dirtier Bukhara, and the mosques and temples were in a more advanced state of deterioration. The US elections happened the morning after we arrived, so it’s possible that the tragedy of their outcomes colored our impression of Samarkand negatively, but it simply wasn’t that nice. We spent our time wandering around in a stupor, in shock and disappointed at the events transpiring in Ian’s home country. The only solace taken was that his home state of Washington was mercifully blue, as little as that meant in the grand scheme of things. We had little desire to settle down in the US before, and even less now, but the implications of such a decision on a global scale are unavoidable. 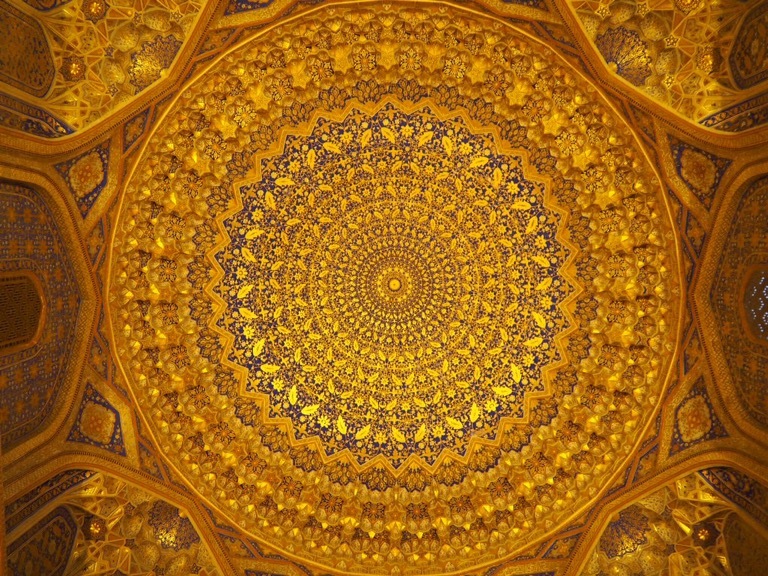 The ceiling of a mosque in Samarkand. Apparently they need to be cleaned from time to time. We ended up buying some hand-painted ceramic plates, which Samarkand is known for, and that was basically the highlight of our stay. It didn’t help that the hostel (Furkhat) was not a particularly nice place to spend time. The beds were excruciatingly uncomfortable, and the room a dingy subterranean dungeon. On top of that, the melodramatic owner tried to overcharge us, and huffed and puffed like an upset toddler when we wouldn’t buy his nonsensical math. Good riddance, we say. The slow train to Tashkent was much like any other train, ambling through the countryside at a steady but unimpressive clip, getting us to our destination some four hours later. We misused much of our time in Tashkent, even though we ended up staying two extra days there. We wandered around town, ate, wandered around some more, bought some stuff, etc. Not for lack of anything worthwhile to do, necessarily, but instead because we were so fed up with all things Central Asian that we couldn’t bring ourselves to enjoy it with our departure so imminent. 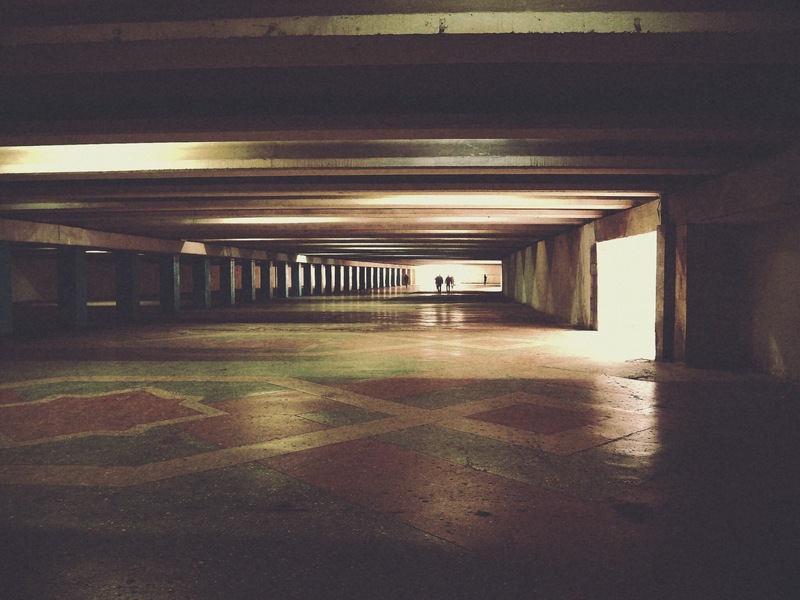 A very Soviet-looking underpass in Tashkent. 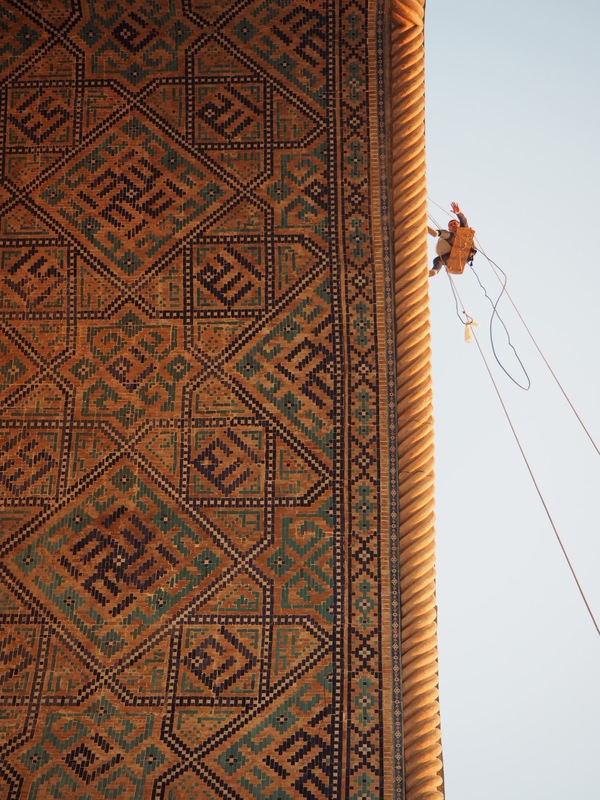 In many ways, Central Asia had been very good to us, and we enjoyed many beautiful things. On the other hand, it had been nearly three months of ex-Soviet or closely-aligned countries, and the constant pushing and shoving, huffing and puffing at any minor inconvenience, and overall lack of enjoyment was wearing us down. From the unsmiling and surly clerks at every shop to the overall dysfunction of transport at large, traveling in this region of the world gets to be exhausting. 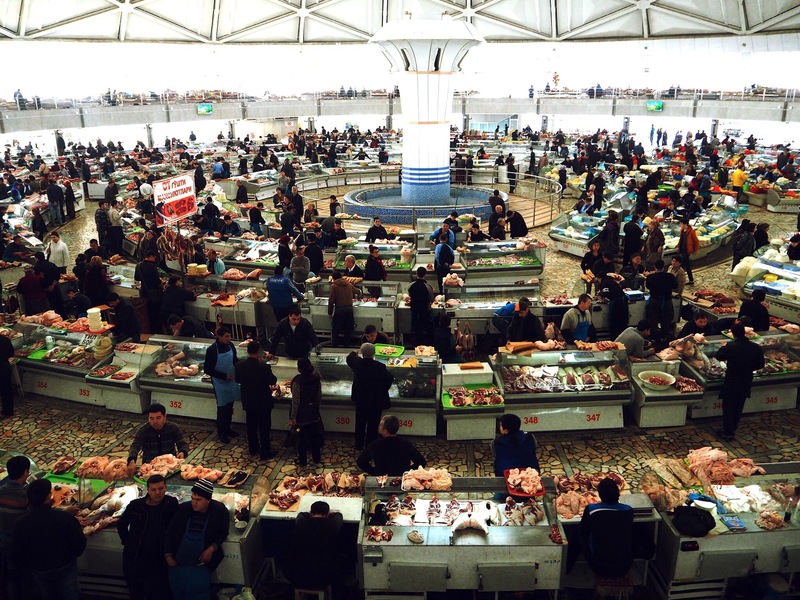 The meat section of Chorsu bazaar in Tashkent. We did manage to enjoy ourselves a few times though. When buying tickets at the train station for our outbound trip, a few local guys helped us maintain our spot in the mob and purchase tickets. They were students eager to practice their English, and they ended up taking us to a great local restaurant the next day and showing us their sweet pad in the city center. Oona also bought a beautiful pair of handmade earrings from the bazaar, which she’s looking forward to rocking soon. 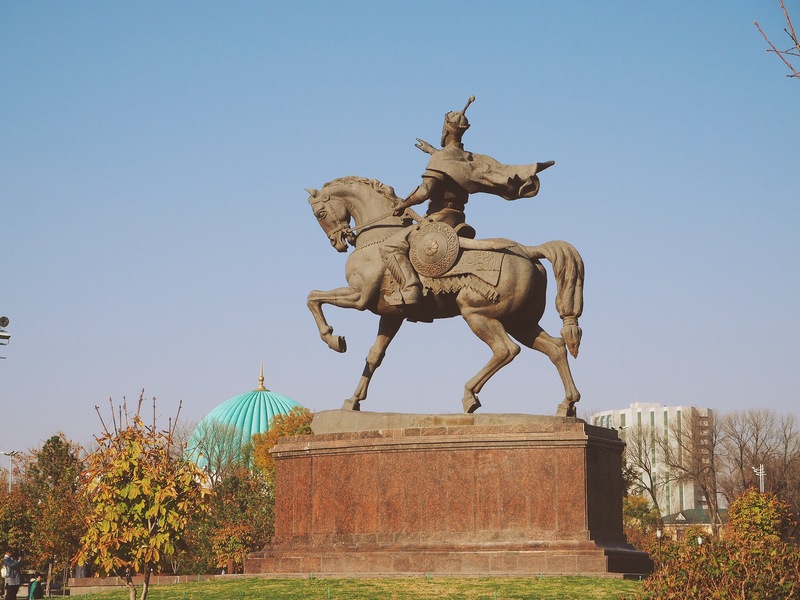 The statue of Tamerlane in central Tashkent. We had a small dinner the night before our early morning departure the following day which struck Ian with a terrible case of food poisoning. Much of his night was spent on or around the toilet, so not much sleep was gotten. Unfortunately, due to our strict schedule over the next few days, there was very little room for taking it slow, and we needed to make it to our train to Andijon, then across the border to Osh, then to Hong Kong the following day. We did eventually make it to Osh. We collapsed on our beds after a long day of travel, and weren’t to be moved from them (save for getting a pizza from the restaurant attached to our guest house) until the next day. After a short taxi ride to the airport we bade farewell to Central Asia, and took off towards Hong Kong. These are incredible photos, thank you for sharing! Thank you! Your blog looks great too, I’m looking forward to following it! Pingback: Lesser Antilles – Sometimes the wrong train will get you to the right place. Pingback: Indonesia and Malaysia – Sometimes the wrong train will get you to the right place.